Saints coach Keiron Cunningham says new England boss Wayne Bennett’s plans are “pretty unfair” on Super League coaches. Aussie Bennett wants mid-season Test matches to be re-introduced and a two-week pre-season training camp with his players which will fall a month before the Super League campaign gets under way. New England Rugby League Head Coach Wayne Bennett, during a press conference at the Worsley Marriott Hotel, Manchester. PRESS ASSOCIATION Photo. Picture date: Thursday February 18, 2016. See PA story RUGBYL England. Photo credit should read: Martin Rickett/PA Wire. RESTRICTIONS: Editorial use only. No commercial use. No false commercial association. No video emulation. No manipulation of images. He went on: “He seems to have very high demands on what he wants players doing - extra fitness, taking them away for a two-week training camp and playing mid-season friendlies. 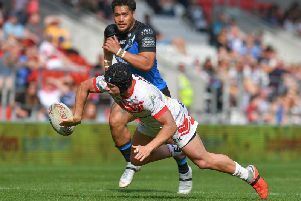 “This is pretty unfair on every Super League coach whose hopes and ambitions lie with having a squad to be fit for training with you every week and also lie in having a six-week pre-season. “If I lose a players to the Autumn internationals, I will only have them back at the end of December.